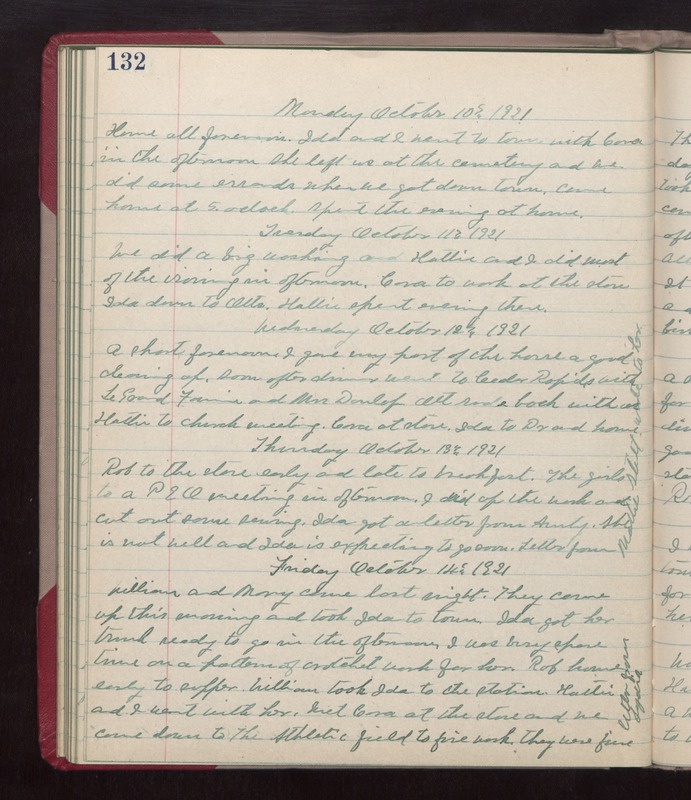 Monday October 10th 1921 Home all forenoon. Ida and I went to town with Cora in the afternoon. She left us at the cemetery and we did some errands when we got down town. Came home at 5 oclock. Spent the evening at home. Tuesday October 11th 1921 We did a big washing and Hattie and I did most of the ironing in afternoon. Cora to work at the store. Ida done to Otts. Hattie spent evening there. Wednesday October 12th 1921 A short forenoon. I gave my part of the house a good cleaning up. Soon after dinner went to Cedar Rapids with LeGrand, Fannie, and Mrs Dunlap. Ott rode back with us. Hattie to church meeting. Cora at store. Ida to Dr and home. Thursday October 13th 1921 Rob to the store early and late to breakfast. The girls to a P E O meeting in afternoon. I did up the work and cut out some sewing. Ida got a letter from Aunty. She is not well and Ida is expecting to go soon. Letter from Mattie Stitt, wrote to her. Friday October 14th 1921 William and Mary come last night. They came up this morning and took Ida to town. Ida got her trunk ready to go in the afternoon. I was busy spare time on a pattern of crotchet work for her. Rob home early to supper. William took Ida to the station. Hattie and I went with her. Met Cora at the store and we come down to The Athletic field to fire work. They were fine. Letter from Lydia.